Senior Shalom Chege has used the boundless opportunities at Florida State University to get one step closer to making her dream of being a physician a reality. Chege, a premedical student with a passion for teaching, was born in Nairobi, Kenya, where she lived with her family for seven years until moving to the United States. Chege cultivated a love of medicine from an early age, aspiring to be like her father, a physician and faculty member at the FSU Family Medicine Residency Program at Lee Health in Fort Myers, Florida. Her decision to attend FSU was solidified after being accepted into the Honors Medical Scholars Society (HMSS), a prestigious professional-track program that helps students to become exemplary scholars on the path to medical school. Chege also received the University Freshman Scholarship each semester and a Benacquisto Scholarship, covering the total cost of tuition. From her first semester on campus, the honor student hit the ground running — pursuing her dream of becoming a physician, while also exploring her love for teaching and giving back to the community. During the summer of 2016, Chege conducted research at the Advanced Pain Management and Spine Specialists Center in Fort Myers, Florida, where she worked under nationally renowned spine specialist Jonathan Daitch. Her research analyzed how patients respond to low habit-forming analgesics. In addition to her rigorous premed coursework and research, Chege still found the time to get involved on campus. She served as service chair for the Honors Medical Scholars Society and as co-president of the organization the following year. She is an honors delegate for the FSU Honors Program and a member of the Academic Recruitment Organization (ARO), where she works alongside high-achieving students to recruit academically talented high school students to FSU. Chege has combined her interest in medicine with her commitment to service through teaching and volunteering, logging hundreds of service hours at nursing homes, homeless shelters, charity farms and other places in various capacities. Currently, Chege is an Algebra I teacher at Gadsden County High School through the Science Students Together Reaching Instructional Diversity and Excellence (SSTRIDE) Program. Miranda Mack, Chege’s supervisor at SSTRIDE, said she was impressed with how dedicated Chege was to teaching while still managing a full course load at FSU. 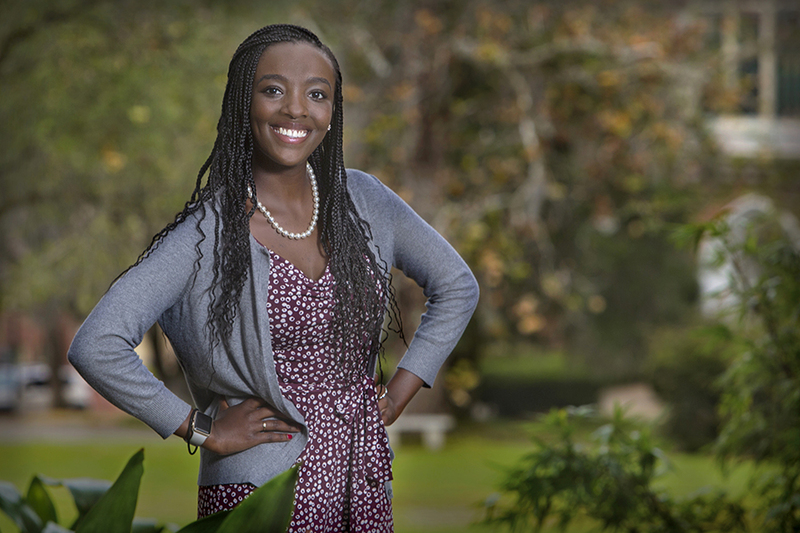 In spring 2016, Chege served as a teacher’s assistant for the Honors Colloquium class where she led breakout sessions on the topics of service, research, leadership, entrepreneurship and global involvement for other FSU honors students. Even with her wide array of extracurricular activities, Chege has made the Dean’s list every semester, earning minors in psychology, chemistry and biology. She also scored in the 91st percentile on the Medical College Admissions Test (MCAT) and is a member of the Phi Eta Sigma National Honor Society. Chege’s hard work paid off — she has been accepted into the Florida State University College of Medicine Class of 2022, where she will continue working toward her dream of becoming a primary care physician.